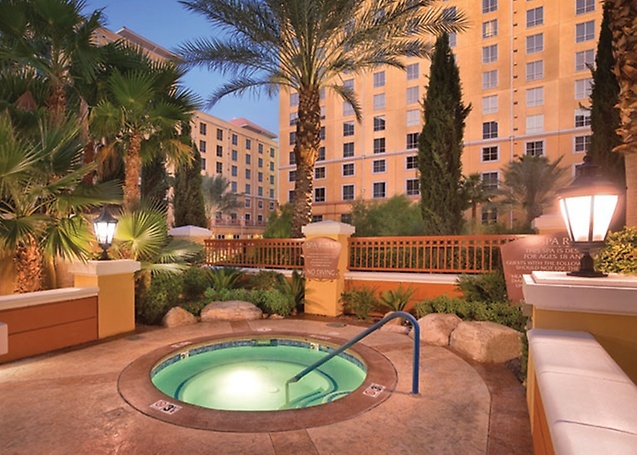 The Wyndham Grand Desert Resort is a nonsmoking property that doesn't have a casino. Located on Harmon Avenue just a few blocks east of the Las Vegas Strip, it's also only a short walk away from the Hard Rock Hotel & Casino and the German beer hall Hofbräuhaus Las Vegas. 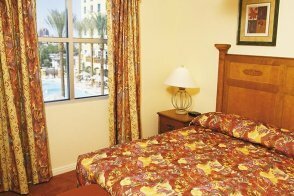 The Wyndham Grand Desert Resort offers spacious one- and two-bedroom suites with kitchenettes. Be aware that daily maid service is not included. 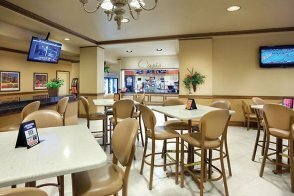 The timeshare provides limited housekeeping services on the eighth day of stay. Those staying less than eight nights will not receive housekeeping service. However, trash removal and towels are provided upon request. 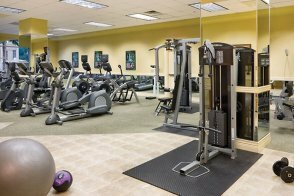 You can enjoy many resort-style amenities including three heated swimming pools, four hot tubs, a sauna, tanning beds and a fitness center. 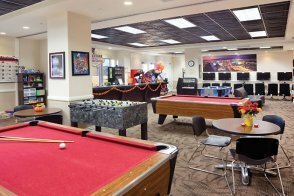 There's also a cafe, a coffee cart and lounge as well as a game room for the kids. 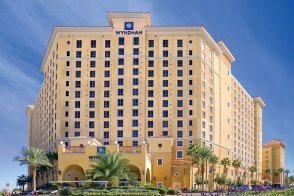 While staying at the Wyndham Grand Desert Resort, you can participate in a variety of events coordinated through the property's activities center or catch a shuttle to the Strip. 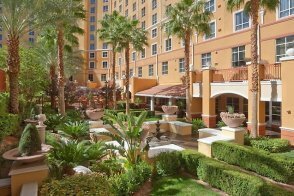 Concierge staff are also available to help you make the most of your Vegas visit. Yes, one cafe and a coffee cart. Yes, three outdoor pools and four hot tubs. 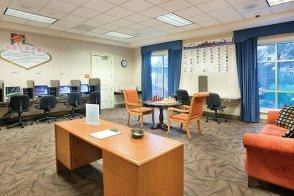 There is a business center with wireless internet capabilities. Concierge, luggage service, activities center. No, but free parking available in the parking lot. A free shuttle runs from the resort to Harrah's between 8:30 a.m. and 10 p.m. daily. Shuttle times are subject to change without notice. Check with the resort. 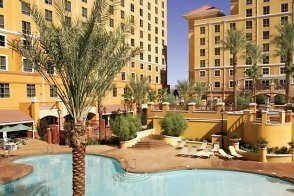 Smoking is not allowed at the Wyndham Grand Desert Resort. Children 17 and under stay free with an adult. The maximum total number of guests (adults and children) in a room is four. 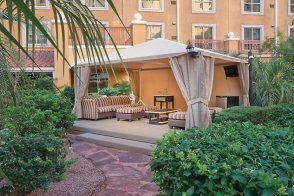 Please note Wyndham Grand Desert Resort practices green housekeeping. It provides limited housekeeping services on the eighth day of stay. Those staying less than eight nights will not receive housekeeping service. However, trash removal and towels are provided upon request. Hotel requires a credit card for incidental charges. 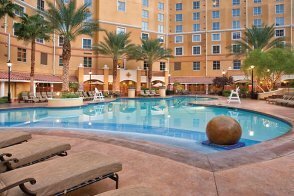 Resort fee Wyndham Grand Desert Resort does not have any resort fees. This suite measures 630 square feet and has a king bed along with a sofa sleeper in a separate living area. There is a kitchenette with a refrigerator, toaster and microwave. Some units have a stove/oven. 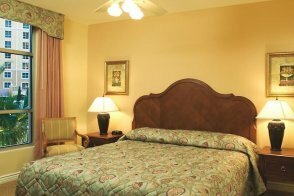 This suite also includes a ceiling fan, a washer/dryer and a telephone with voice mail and free local calls. The bathroom has a shower/tub combination. This suite measures 1,300 square feet and has one king bed in the main bedroom, two double beds in the second bedroom and one sofa sleeper in a separate living area. There is a kitchenette with a refrigerator, toaster and microwave. Some units have a stove/oven. This room also includes a ceiling fan, a washer/dryer and a telephone with voice mail and free local calls. There are two bathrooms with shower/tub combinations. 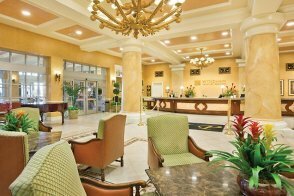 Click on a check-in date below to view available rooms. Prices displayed above reflect the average daily rate for a 2-night stay beginning on the linked check-in date.